January Jones to Play Figure-Skating Mom in Netflix’s Spinning OutThe rest of the cast includes Kaya Scodelario and Johnny Weir. What Does Lisa Vanderpump Have Against January Jones?All Jones wanted was a birthday party at Vanderpump’s restaurant. She was denied. January Jones Is Dating … Oh My God, Who?And more in this week’s celebrity gossip column. I Think About This a Lot: Paparazzi Photos of January Jones Getting Out of a CabMultiple sites ran the photos with some variation on the phrase “walk of shame.” To me, all of this seems glamorous as hell. 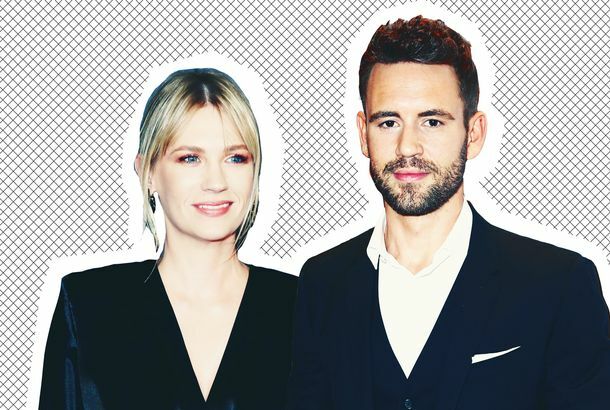 January Jones Up for a Gosling-Mendes ThreesomeShe’s only human. January Jones Wore Sheer PantsEven her clothes DGAF. January Jones Continues to Be a Hero for the AgesMrs. Jones and me. January Jones, You Are a Secret DGAF HeroTwenty supporting pieces of evidence. January Jones Would Totally Sleep With Rihanna Get in line, January. Drew Barrymore on the Merits of Public Versus Secret PregnanciesNow that she’s experienced both. Emmys Red-Carpet Trends: Beige, and More BeigeSome were sparkly, others more pinkish, but all belonged to the same non-color family. To Discuss: Betty’s ‘Skinny’ Dress on Mad MenThe most symbolic outfit of the episode. Which Mad Men Actors Look Most Like Their Characters?And is this a good or a bad thing? Kiernan Shipka Now Resembles Young Betty DraperWhen Betty was still blonde and … well, you know. January Jones Gives a Mad Men Sneak Preview at Miu MiuBetty Francis, it’s you! January Jones Should Take This Here Hair PillShe’s recently lamented about her thinning follicles. On Social Media, the Best Behind-the-Scenes SAG Awards Beauty PrepJessica Chastain and Jennifer Lawrence were both caught in the bathroom. January Jones Played the Pajama Game [Updated]She wore a silk jumpsuit in L.A. yesterday.